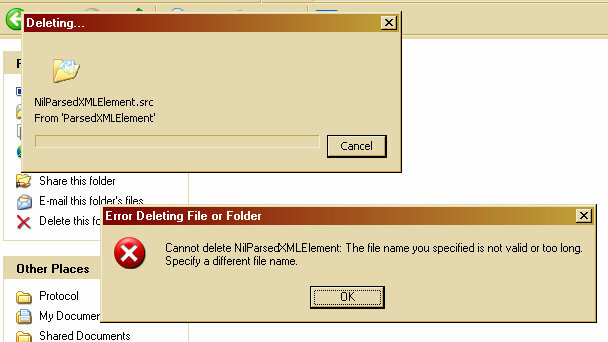 While deleting unwanted Temporary Internet Files from a computer, I encounter an error: "Cannot delete NilParsedXMLElement: The file name you specified is not valid or too long. Specify a different file name." That doesn't look like an invalid or long file or folder name. Is it possible to create a file or folder name longer than can be deleted? Is it possible to create a file or folder with an invalid name? Since it says to specify a different name, I try renaming the folder. 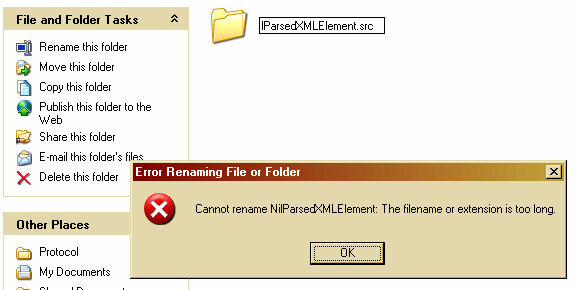 I get an error: "Cannot rename NilParsedXMLElement. The filename or extension is too long." I thought Windows XP supported file and folder names larger than 19 characters. So, what should one do with a temporary folder that cannot be renamed or deleted? You can use Long Path Tool, it works good for such problems..